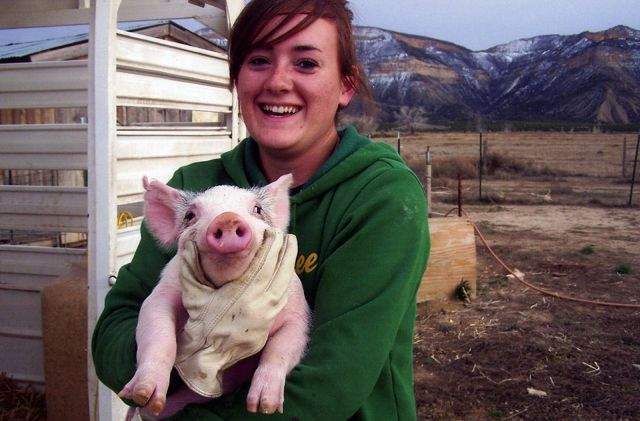 Rachelle Moore holds one of her feeder pigs in this undated photo. Moores FFA project was selected to compete at the National FFA Convention this fall. At 18 years old, Rachelle Moore is a businesswoman. In fact, Moore is so good at what she does that she has been recognized for her entrepreneurial skills, taking first place in the agri-entrepreneurship swine production category at the Colorado State FFA Convention, held July 8-10, in Craig, and earning the right to compete at the National FFA Convention on Oct. 20-23 in Indianapolis. A 2010 graduate of Montezuma-Cortez High School, Moores chosen area of expertise is feeder pigs, which weigh 60 to 80 pounds and are 6 to 8 weeks old. For the last four years, the 4-H and FFA member has purchased an increasing number of the animals. Moore has fed her pigs, raised them, showed many of them at the Montezuma County Fair and sold them. The teen has earned herself a nice nest egg in the process. Moores interest in swine began years ago in an effort to follow the steps of her older siblings. Once she entered high school, Moore decided she wanted to do more than simply raise show pigs. Moores ultimate ambition was to place in the Gold category at the state convention, the highest awards category at the competition. She knew that in order to reach that goal, she needed to create an ambitious project. Beginning her operation four years ago with five feeder pigs, Moore slowly built her business, purchasing 12 in 2008, 18 in 2009 and 25 this spring. The pigs typically weigh close to 40 pounds when Moore purchases them. They are sold at 280 pounds. To keep her operation within the project parameters, Moore has kept detailed records of each step along the way in raising her pigs. She also has mastered the fine art of mixing her own rations for her animals in an effort to give them the specific nutrition necessary to facilitate ideal growth. In addition to raising the feeder pigs, Moore selects a few pigs each year as show pigs, which adds an extra level of responsibility. The pigs are selected based on gait and build. Moore constantly works with her show pigs to ensure they are ready for the fair. Moore, who spends the majority of her days with the pigs, plans to show three pigs at the local fair this year. She also hopes to show two at the state fair. To maintain her project requires plenty of work, and Moore has benefited from the effort. Moore plans to attend Northeastern Junior College in Sterling in the fall, majoring in agricultural business and agricultural education. She hopes to return to the Cortez area one day as an ag teacher.